With the food crisis escalating in the Sahel region of Africa, it’s urgent that children be protected from hunger and kept in school. In Burkina Faso, one of the affected Sahel countries, the UN World Food Programme (WFP) provides school feeding for impoverished children. These meals take on even more importance during the current hunger emergency. When drought strikes, families are more likely to remove their kids from school and keep them home to work. However, If there is food available at the school then parents are more likely to keep their children enrolled. In this interview Célestine Ouédraogo of WFP updates us on the status of school feeding in Burkina Faso as the Sahel food crisis unfolds. 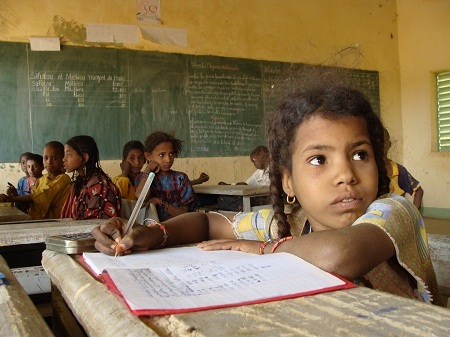 How many children are receiving WFP school meals in Burkina Faso? Each year 90,019 children enrolled in 691 schools in the Sahel Region benefit daily from a flour-based fortified breakfast and couscous-based lunch. In addition to the meals served in schools, 9,510 girls enrolled in the last two grades are receiving a take-home ration of 10 kg of cereals per month, which encourages parents to keep the girls in school and enable them to complete the primary school cycle. Are these schools in the areas affected by the drought? Yes, all these schools are in the areas affected by the drought. The Sahel region is one of the most food-insecure regions, and has among the highest rates of malnutrition. Does WFP intend to expand school feeding in Burkina Faso? least the rest of the year? YES, thanks to the generosity of 2/3 donors, we have been able to secure funding up to end of 2012, which is essential if we want to ensure that children can pursue their education despite the food insecurity that the country is facing this year. Article first published as Sahel Food Crisis: An Interview with Calestine Ouedraogo of WFP in Burkina Faso on Blogcritics.